Voice your opinion! Review Shades Awnings now. Shades Awnings was, ever since, my top choice to do my awnings for our backyard, having seen their works from my relatives a few months back. And they did not fail my expectation! The colour, the trimming, the design, and the ease that automated awnings bring was exactly how I imagined it to be. 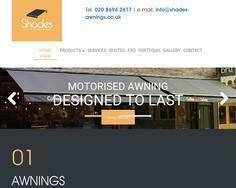 Is Shades Awnings your company?